Fish farmers investigate alternative fish species which are suitable for aquaculture. Intensive aquaculture of freshwater fish farmers targets species of high market value that are easy to domesticate and rear. Himri Barbel is indigenous cyprinid in the basin of Mesopotamia and highly valuable as food in the region. Some observations on himri indicated to promise possibility of being used for aquaculture in polyculture ponds, since it is omnivorous and detritus feeder (Epler et al., 2001). Adaptation to earthen ponds with common carp, Cyprinus carpio, and other cyprinids has been noticed when it entered accidentally with water flux to ponds nearby Euphrates River which could consider it as a new species for the aquaculture (Al-Hazza and Hussein, 2003b). Polyculture aims to increase productivity by a more efficient utilization of the ecological resources in the aquatic environment (Lutz, 2003). Thus, stocking two or more complementary species can increase the maximum standing crop of a pond by allowing a wider range of available foods and ecological niches (Da Silva et al., 2006). Cyprinids are one of the most important groups of teleost fish quantitatively cultivated worldwide (Kaushik, 1995). Culturing different cyprinid species in the same pond optimizes the utilization of the food available in the ecological niches of the pond ecosystem (Kestmont, 1995). Some studies have been done on the biology of Himri Barbel in Iraq, Syria and Turkey (Epler et al., 1996; Szypula et al., 2001; Al-Hazza, 2005), but there is little information on culture (Al-Hazza and Hussein, 2003ab; Gokcek and Akyurt, 2007; Gokcek et al.,2008). Over exploitation of natural stocks because of high demand and the deteriorated environmental conditions has resulted in marked decline of Himri Barbel in wild population. Recent studies have been instigated to attempt to propagate this species artificially for conservation and aquaculture purposes. The aim of the present study was to evaluate the introduction of Himri Barbel into the traditional carp polyculture under experimental conditions. Common carp (C. carpio) fry were obtained from a local fish hatchery and acclimatized to the laboratory conditions. Himri Barbel fry were produced from broodstock kept in captivity in the aquaculture unit of Mustafa Kemal University, Common carp (C. carpio) fry were obtained from a local fish hatchery and acclimatized to the laboratory conditions. Himri Barbel fry were produced from broodstock kept in captivity in the aquaculture unit of Mustafa Kemal University, Hatay, Turkey. Poultry manure was used to fertilize the nursery pond. Larvae were weaned over a 45-day period by substituting plankton with a commercial trout diet, grounded and sieved to 250 μm (Çamlı Yem A.Ş., İzmir-Turkey). After nursery, fry were transferred from outdoor earthen ponds to indoor research unit to initiate the study. A commercial carp diet obtained from Çamlı Yem A.Ş., İzmir-Turkey was used during the experiment. The diet was made from cereal grains, fish products, oil seed products, land animal product oils, fats and minerals. Proximate composition of the fish diet was analyzed according to Official Methods of Analysis (A.O.A.C., 1990). Analysis results were found as 12% moisture, 12% crude lipid, 40% crude protein, 3% crude cellulose, 13% crude ash with digestible energy 3223 kcal/kg. The fry were stocked into 100-L (40x40x80 cm) aquariums. The aquarium unit was provided with aeration through an air compressor and thermostat was used to keep water temperature constant at 260C. Feces and waste feed were removed from the aquariums bottom periodically by siphoning and 20% of water was replaced with clean tap water. Siphoning periods were every three days until the15th day, then every other day for the rest of the study. Sixteen fish were stocked in each aquarium. Treatment groups were designed according to different stocking proportions of carp and himri and named as S1 (100% carp), S2 (75% carp and 25% himri), S3 (50% carp and 50% Himri), S4 (25% carp and 75% Himri) and S5 (100% Himri). Five treatments held in triplicate. Fry with the average weight of 1.10 g were stocked into the aquariums and fed with a commercial diet three times a day (08:30, 12:30 and 16:30) throughout the 90 days experimental period. Fish from each aquarium were weighted separately by the species at biweekly intervals and their average weights were recorded. Water quality parameters of dissolved oxygen (DO) by YSI-52 model O2-meter, pH by Hanna model pH-meter, total ammonia nitrogen (TAN) by spectrophotometer were monitored weekly. Un-ionized Ammonia Nitrogen (UIA-N) concentrations were calculated from TAN measurements using pH and temperature values (Boyd and Tucker, 1998). A one-way analysis of variance (ANOVA) was used to compare growth rate, feed conversion ratio and survival among treatments. All data were analyzed by using SPSS computer program (SPSS System for Windows, Version 10.0). Duncan test was used to determine the differences among treatment means when F-values from the ANOVA were significant. Water quality parameters of temperature, dissolved oxygen (DO), pH, and TAN were measured weekly and the average values with their standard deviations were given in table 1. The water temperatures of the all treatments tried to be constant at around 26 °C during the experiment by adjustable thermostat heaters. DO levels showed significant differences between treatments and the highest average level (7.75 mg/L) occurred in S5. The lowest DO concentrations were 6.01 mg/L and 6.22 mg/L measured from S3 and S2, respectively. The average pH levels changed from 7.51 to 8.45 with significant differences between treatments. The pH of S5 treatment was the lowest and pH of S3 was the highest (P < 0.05). The mean TAN concentrations were significantly different for each treatment with 0.279 mg/L for S5 which was the lowest and 0.762 mg/L for S3 which was the greatest. UIA-N concentrations were similar to TAN concentrations just because of the calculations of UIA-N made from TAN values based on pH and temperature. Table 1. Water quality parameters during nursing of common carp and himri barbel fry in aquariums(±SD.). The production parameters are given in table 2. The fish survivals were similar between treatments without any significant differences (P > 0.05). The FCR values of all carp treatments were not different from each other and averaged 1.2 (P > 0.05). S5 treatment which stocked with himri only, however, was significantly higher FCR value of 2.69. SGR (%) values were calculated separately for each fish species in each treatment. The comparison of average SGR values were made on species base within the same treatment and other treatments and found significant differences in each comparison. SGR values of carp were different for each treatment and the lowest value of 2.53 obtained from S1 and the highest value of 3.45 obtained from S4. The SGR values increased with decreasing carp ratios in the aquariums. The lowest SGR value of himri was 1.29 calculated from S2 and the highest value was 1.64 calculated from S4. Table 2. Growth, feed conversion ratio, and survival of common carp and himri barbel during 90 days of nursing at different stocking densities(±SD.). Final weights of the fish were compared between the treatments within the same species (Figures.1,2 and 3). Individual weight of carp increased with decreasing stocking ratios in the aquariums, and there were statistical differences for final weight of carp stocks between treatments. The lowest average final weight of carp was obtained from (S1) with the value of 11.42 g and the highest value of 25.71 g was obtained from S4. The average final weight of himri from S4 was significantly higher than S2 and S5, on the other hand was similar with S3. Total biomass at harvest from himri only treatment was significantly lower than all other treatment with the value of 63.77 g. The highest total biomass of 181.76 g obtained from S2 treatment showed no significant differences from S1 and S3 but S4. In the present study, monitored water quality parameters remained within the optimum range for culture. Gokcek et al. 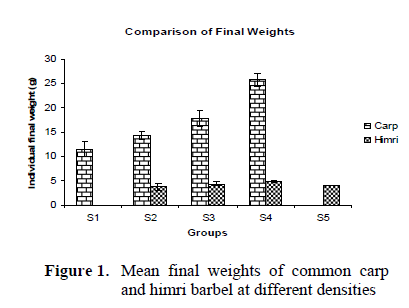 (2008) observed similar water quality values during the nursing of himri barbel fry under the same laboratory conditions. The fish survival (93.75 ±6.25 to 100.00 ±0.00) of the present study can be comparable with earlier studies on carp polyculture (Jena et al., 2001, 2002ab). In the presence of himri barbel, no significant variations in the survival of common carp among the treatments suggest possible compatibility among the species. Further, the high survivals of himri barbel promise us to ease of culture condition. Higher survival of himri barbel was also recorded by Gokcek and Akyurt (2007) in cage culture. A few studies had been done about polyculture of barb species with other Cyprinids. For example, a synergistic interaction between silver barb (Barbodes gonionotus), a bottom feeder, and common carp has been reported by Haque et al. (1998). Azim et al. (2004) reported that silver barb competed with both native and exotic common carp in earthen ponds. Jena et al. (2007) reported that although a certain extent of competition of silver barb with mrigal, Cirrhinus cirrhosmus, was evident, competition with catla, Catla catla, was not perceptible. In the present study, increased production of common carp was achieved by polyculture with himri barbel. The best total yield and FCR were achieved from S2, so it might be clearly recommended that himri can be added to carp polycultre system at a 25% stocking density of the total biomass. In nature, himri barbel is a bottom feeder that feeds on detritus, plants and zooplankton but also migrates throughout the water column to feed (Naama and Muhsen, 1986). In this experiment, submerged feed was used as experiment diet, so the decrease in himri harvesting weight, growth rate and yield from the denser stocks of carp might be the result of competition between carp and himri since they are both bottom feeder and carp feed more aggressively on the bottom, browsing in deeper layers than himri. On the other hand, the less dense stock of carp at polyculture stocks positively affected the growth performance of himri by competition for food and space. The low growth performance and feed efficiency of himri indicated that present commercial diet was unable to meet with the nutritional requirements of this species. Since the nutritional requirement of this species is still unknown, himri barbel may require lower or higher levels of protein and energy for optimal growth. On the other hand, the mechanism for food selectivity of the experimental fish species is also unexplored. Before introducing this species for wider commercial application in semi-intensive or intensive polyculture with fertilizers and supplemental feed, all these unknown characteristics of himri should be clarified. Al-Hazza, R., Hussein, A., (2003b. ), Stickiness elimination of Himri (Barbusluteus, Heckel) Eggs. Turkish Journal of Fisheries and Aquatic Science, 3: 47-50. Al-Hazza, R., (2005), Some biological aspects of the HimriBarbel, Barbusluteus, in the intermediate reaches of the Euphrates river. Turkish Journal of Zoolgy, 29: 311-315. A.O.C.A. (1990), Official methods of analysis. Association of official analytical chemists. 15th edn. Virginia, USA. Azim, M.E., Wahab, M. A., Kamal, A.H.M., Zoarder, F.A., (2004), Feeding relations of Silver Barb Barbodesgonionotus (Bleeker) with Major Indian and Common Carp and its effect on fish production in a polyculture system. Journal of World Aquaculture Society, 35(1):100-108. Boyd, C.E., Tucker, C.S., (1998), Pond aquaculture water quality management. Kluwer Academic Publishers. USA. Da Silva, L.B., Barcellos, L.J.G., Quevedo, R.M., Souza, S.M.G., Kreutz, L.C., Ritter, F., Finco, J. A., Bedin, A.C., (2006), Alternative species for traditional carp polyculture in southern South America: Initial growing Period. Aquaculture, 255: 417-428. El-Sayed, A.F.M., (2002), Effects of stocking density and feeding levels on growth and feed efficiency of Nile Tilapia (Oreochromisniloticus L.) fry. Aquaculture Research, 33: 621-626. Epler, P., Sokolowskja-Mikolajczyk, M., Popek, W., Bieniarz, K., Kime, D.E., Bartel, R., (1996), Gonadal development and spawning of Barbussharpeyi, Barbusluteus and Mugilhishni in fresh and saltwater lakes in Iraq. Archives of Polish Fisheries, 4: 113-124. Epler, P., Bartel, R., Chyp, J., Szczerbowski, J.A., (2001), Diet of selected fish species from the Iraqi lakes Tharthar, Habbaniya and Razzazah. Archives of Polish Fisheries, 9: 211- 223. Gokcek, C.K., Akyurt, I., (2007), The effect of stocking density on yield, growth and feed efficiency of HimriBarbelBarbusluteus (Heckel,1843) nursed in cages. The Israeli Journal of Aquaculture, 59(2);99-103. 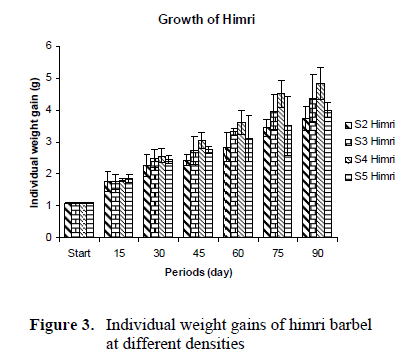 Gokcek, C.K., Mazlum, Y., Akyurt, I., (2008), Effect of feeding frequency on the growth and survival of himribarbelBarbusluteus (Heckel, 1843), fry under laboratory conditions. Pakistan Journal of Nutrition, 7(1): 66- 69. Haque, S.M., Wahab, M.A., Wahid, M.I., Haq, M.S., (1998), Impacts of Thai silver barb (PuntiusgonionotusBlecker) inclusion in the polyculture of carps. Bangladesh Journal of Fisheries Research, 2: 15-22. Jena J.K., Ayyappan S., Aravindakshan P.K., Muduli, H.K., (2001), Comparative evaluation of growth, survival and production of carp species at different stocking densities under polyculture. Indian Journal of Fisheries, 48;17-25. Jena J.K., Ayyappan S., Aravindakshan P.K., Dash B., Singh S.K., Muduli, H.K., (2002a. ), Evaluation of production performance in carp polyculture with different stocking densities and species combinations. Journal of Applied Ichthyology, 18:165-171. Jena J.K., Ayyappan S., Aravindakshan P.K., Muduli, H.K., (2002b. ), Comparative evaluation of production performance in varied cropping patterns of carp polyculture system. Aquaculture, 207:49-64. Kaushik, S.J., (1995), Nutrient requirements, supply and utilization in the context of carp culture. Aquaculture, 129: 225–241. Kestmont, P. (1995), Different systems of carp production and their impacts on the environment. Aquaculture, 129: 347–372. Lutz, G.C., (2003), Polyculture: principles, practices, problems, and promises. Aquacultural Magazine (March/April). Naama, A.K., Muhsen, K.A., (1986), Feeding periodicities of the Mugilid Liza abu (Heckel) and Cyprinid Carasobarbusluteus (Heckel) from Al-Hammar Marsh, Southern Iraq. Indian Journal of Fisheries, 33(3): 347- 350. Szypula, J., Epler, P., Bartel, R., Szczerbowski, J.A., (2001), Age and growth of fish in lakes Tharthar, Razzazah, and Habbaniya. Archives of Polish Fisheries, 9: 185-197.